ESG6 Clean Up Crew is the first round scenario of the Asia Pacific VASL tourney, Deathwish 777. This is the first Eastside Gamers scenario I have ever played. This is also the first time I played Will Fleming. This is an interesting situation. The 2 hex building on the top right is considered ground level only stone while all other buildings are wooden. The German wins at Game End if they control this building. If you look at the map in quarters, Germans setup on the top left and bottom right. 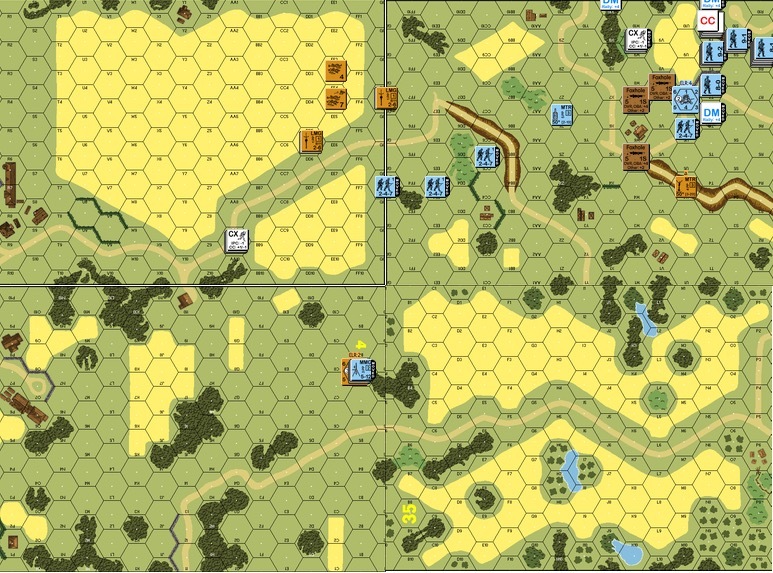 A Russian patrol comes in on Turn 1 from either the left edge or the bottom edge of the bottom left quadrant. Both sides get to attack and to defend, the 6 turn limit on this scenario promised rapid and violent action! The Germans have a mix of elite and first liners. The Russians have a mix of first liners and conscripts (one elite squad too) but unfortunately an ELR of 2. They get 2 leaders on board, an 8-1 and a 7-0. A 9-1 comes in with the patrol later on from the lower left board. There was a bit of a debate as to whether to switch the 8-1 out for a 10-0 Commissar or not. Bruce Probst cautioned against the idea on GameSquad, stating that there really is no where for the Russians to properly rout to and that they should take the -1 Leadership from a fighting 8-1 instead. In hindsight, he’s right (no surprise). At the time, I swapped the 8-1 for a 10-0 in the hopes of cycling whimpering conscripts back into the fight again. 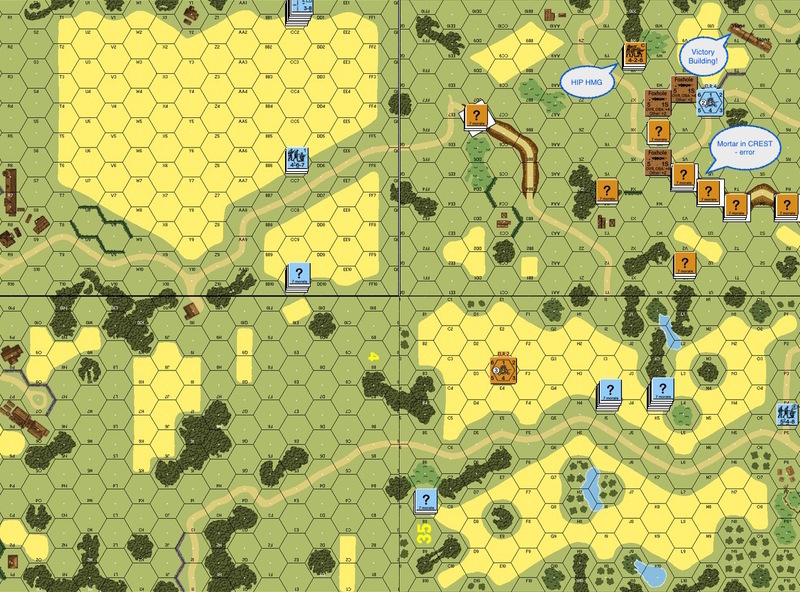 German Turn 1 : The Germans were on the move. The Russians looked to reveal as little information as possible until the Germans came within their (largely) 2 hex range, less when negative modifiers were in play. There wasn’t much action apart from the outer ring of “speed bump” conscripts. They didn’t expect to survive the slightest German fire and so their first shot needed to count. Russian Turn 2 : The Germans built a deathstar with a 9-2 in the left sunken road. Our HMG team had to relocate. Will Fleming also pointed out that mortars cannot fire from CREST positions so the mortar team had to figure out a plan B. One of the “speed bump” conscripts broke another German unit instead of running but got disrupted and was captured in the return fire. 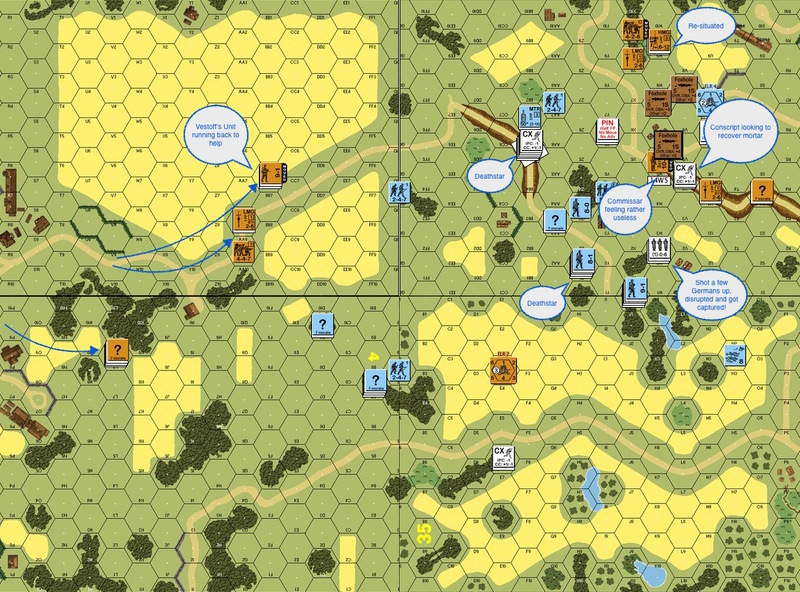 The rescuing Russian patrol had entered the map but not the fray at this point from the left edge. Russian Turn 3 : The rearmed prisoners (Conscript HS) grabbed the German DC. There was a German DC HS on the left end of the sunken road to the right. A Russian squad assault moved away to draw fire in the safest way possible but was disrupted anyway. The rearmed Russian HS then rushed down the sunken road with their captured DC!! They survived the Final Fire from the “targeted” German DC HS, threw their DC and broke that HS. Unfortunately it was pinned itself and couldn’t advance to rout the broken Germans out of the foxhole. The Russian commissar decided to vol break and head towards THE house as Russian troops around him were either disrupted as conscripts or ELR’d into being conscripts. German Turn 4 : The Germans moved towards the house and the Russians didn’t have too many live units left around the target building. A German MMC on the left put a fire lane down through the grain fields and made it tough for the rescuing patrol getting into the fight on time. 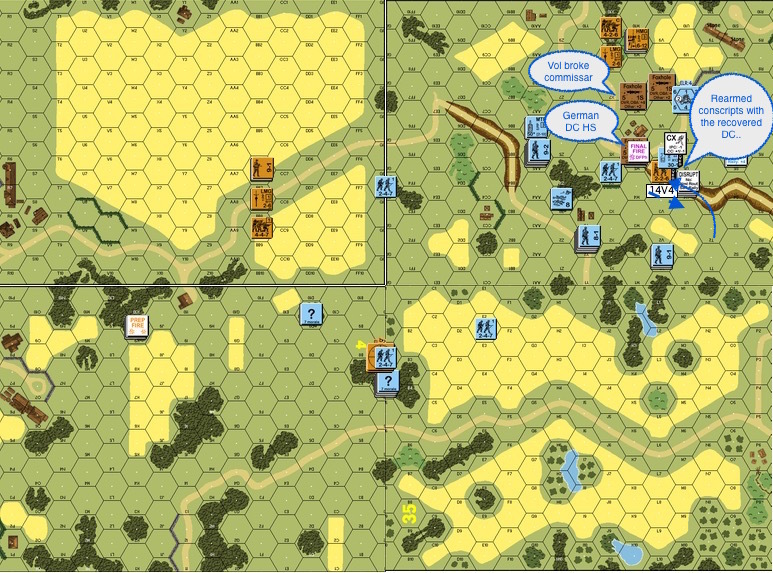 A German stack Adv Fired into the Russian HMG team through the brush – and rolled snakeeyes. The random selection that followed slated the full Russian squad for destruction, leaving a broken 7-0 with the gun. There was pretty much no one, save the routing commissar and a solitary conscript squad, in the target building. German Turn 5 : The Commissar finally pulled himself together and joined the conscripts in the stone building. Between stacking up for better mutual support or spreading out to keep the Germans out of the building, they chose the former. The conscripts dutiful fired at the incoming Germans and did brilliantly well for the most part but things came apart at the end when the Germans rolled another snakeyes in the Adv Fire and broke the squad. German Turn 5 (contd) : The commissar found himself the sole defender of the house when the German broke through the windows and doors. The ensuring close combat was 6-1. For a moment I had hope that the commissar would roll snakeeyes as well to kill off the entire German stack but it was not to be! The hardy commissar got wounded and finally succumbed to his wounds into the long quiet night. Will Fleming is a terrific person to get to know and to play ASL with. The 10-0 (if indeed a decision’s made to swap the 8-1 out) should be in the fight and helping to raise conscripts morale. The ELR of 2 had a material impact on this game. Seeing that most of the Russians ELR’d and/or Disrupted – routing, rallying and fighting was not the right strategy. Taking a fighting 8-1, fighting and dying in place might be a better decision. As a rout path, my foxholes were not properly lined up especially when there were Germans coming in from 2 angles. Thoughts? Comments? Alternate strategies? Additional thoughts on 10-0 commissar vs 8-1? This entry was posted in Game Play and tagged AAR, Advanced Squad Leader, ASL, board wargame, Deathwish 777, Hong Kong, wargames, World War II. Bookmark the permalink. Hey, if I line my foxholes up properly, folks can route and I can use the commissar. Or like you said, use the commissar to help the conscripts out. Between this and the ASL page on Facebook I’ve learned more about ASL in the last year than I have in the last three or four. Great AAR. Bryan, you are very kind!! Just being factual. Before the year is over I’ll be playing on VASL, damn it!